Demonstrations increase in size each day. On the first Tuesday of the month, we venture down to the train station in the afternoon. The spirit present is quite inspirational: people of all ages and of all positions gather together. They are as surprised to see a couple of tourists in Aswan as we are about their political openness. A police presence is noticeable, but the demonstration is entirely peaceful and very hopeful. The public prayer cements the belief that these Egyptians have in reform. 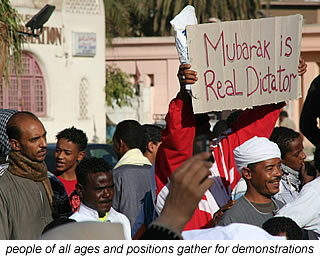 The following day, Mubarak supporters take to the street. They don't walk: they instead drive cars; ride motorbikes; hire a horse and carriage or a taxi. The lack of police is noticeable and the demonstration has an aggressive tone. The same happens in Cairo but ends up in violence. Abu Simbel remains closed; banks are still shut; internet is down and we are at a standstill in Aswan. Our money is low. Ali tries to make a phone call to the Netherlands so his sister can transfer money to our depleted card via internet banking. Like most business enterprises, the telephone centre is no longer in operation, but is rumoured to be opened tomorrow. He finds enough people prepared to let him use their mobile phone if he can find a callcard. Again, this is difficult and street vendors try to add greedy profits to the actual cost. A day later he gets through to his sister and he can then join the long queue leading to a single working ATM to withdraw the 500 Egyptian pound maximum. He lines up twice. With money in the pocket, it is time to move on. We meet Andrew and he also wants to leave Aswan in the direction of Luxor. The taxi bargaining process starts at 650 LE. It ends at 200 LE and the price we are prepared to pay for the 230 kilometre journey back along the Nile. Luxor has an eerie silence about it. No tourists and not many locals on the streets. Military tanks or large blue police vans punctuate the town. There are no demonstrations here anymore. Shop vendors around this area are still adamant about trying to rip a tourist off, so most of my shopping is done in the souq and Masria Market, where I have already established relationships with the sellers. I can't be bothered disputing prices anymore. The arguments with the management at Happy Land Hotel are enough and make it anything but a jolly place to stay. Things fall apart in their rational behind the obsessive 'pay beforehand policy' when Aaldrik refuses to hand over 25 LE for the daily internet service they offer until they switch on the router and we can actually connect to the internet. Unfortunately for them, they haven't paid their bill. They dispute this, but I can clearly see on my laptop not only their account and telephone number, but the invoice for 45 LE required to be paid for a one month connection. There are a million excuses - none of which are the management's fault and miraculously internet is restored soon after someone physically walks down to the office and pays the bill. On the way they could have picked up a jar of Nescafe and some honey portions too, since these are missing from our breakfast three mornings in a row. The same breakfast they boast loud and proud about when you book in; the same breakfast list they run through item by item. On the bottom of this notice they could also add that one of the housemaids has a habit of throwing the breakfast plates on the table. Our solitude is Esquire-pub2000 where we sit each evening in pseudo-English tradition with Andrew and the cleanest toilets in all of North Africa . It is really fine to be away from the hassle of the street and the Egyptian scams before embarking on our koshary order for the evening. The Koshary restaurant down the road is a perfect example. First they will try to charge you more than the menu price; secondly they will give you a portion without much topping and thirdly they will use a slightly smaller container. A different and honest man is at the cash register on our fourth and last evening. I order the usual. Not only is the amount of chickpeas, lentils and fried onions double, but halfway through eating our meal, we are all feeling really full. I retrieve the empty koshary packaging out of the rubbish bin, which of course is still there from yesterday. Sure enough we had been scammed for three evenings running. It is a late start after a late breakfast, even though I asked three times the evening prior if it could be ready at 7.30am. Andrew leaves refusing the offer of a 50 LE pound taxi to the bus station. The bar-attendant at Esquire-pub200 had told us that a share taxi costs just 50 piastres. We say our goodbyes and cycle off down the Corniche only to be stopped a number of kilometres past Karnak Temple. The road is closed according to the police and they want us to return and take the highway. We insist on using this small road. They insist that it is dangerous. We insist some more and they let us through. It is not dangerous at all, as we suspected. It is just their way of keeping everyone on the main road, which we would prefer to avoid for as long as possible. Nothing but "welcomes and hellos" greet us plus the occasional pack of excited kids, which I am still a little wary of. 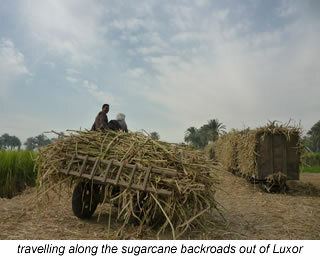 Along sugarcane strewn paths, we move around carts, donkeys, trucks and workers. One man spontaneously cries "No Mubarak". An echo choruses from the fields and they are soon alive with the chant: "No Mubarak! No Mubarak!" Unfortunately, we hit the highway after 20 kilometres and continue on a much less entertaining cycle. The outskirts of the surprisingly large city of Qena is at our 67 kilometre mark. After stopping at 4 stores, I find a place that doesn't want to charge us double for the 6 bottles of water we want to stock up on. We leave with the intention of camping wild about 30 kilometres out of town. There are many perfect spots to choose from and so we renege the kind offer from the ambulance station, 19 kilometres out of Qena, to spend the night. Unfortunately the police have a different plan and from this point on they are on our tail and refuse to let us pitch our tent anywhere except at their check point. Their excuse is that it is dangerous out here, which is totally untrue of course. If anywhere is dangerous, it is at a police checkpoint. Anyway, too much time is wasted over the futile discussion and as dusk dims our light and they threaten to arrest us if we try to camp, we end up giving in and pedalling back to 28 km after Qena (100km; 177m). But only on the proviso that we don't have a police tail tomorrow. They agree. We should have known better. The police don't keep their promises around here and they stand ready to follow as we set off in the morning. Telling them we don't want a tail is just like telling them to go away from our tent as we go through the morning motions. They disappear for a while, but then they are back, intruding in our day. No matter what we say, they just won't budge. While Ali is going nuts at them, I resort to signing a postcard I have had flapping around in my handlebar bag with "No Police, Thank you". They miraculously return to their checkpoint. I wonder if the postcard of El Alamein in the north is pinned to the Chief's pin-up board now. The journey is very hot. Hotter than we have had in a very long time. Since the turnoff out of Qena the incessant horizontal cracks in the road have been really annoying too. Luckily, there are plenty of points along the way to stop, rest and fill up on water. We climb very slowly, very gradually until we reach the third checkpoint of the day (after 57 kilometres), where police tell us to move on but to be careful because, once again according to them, it is dangerous. Low gradients continue to take us to a height of 771 metres. A great downhill follows until a bend in the road sends us along flat paths past dusty salmon pink rock formations and into a push against the wind for a couple of kilometres. The next downhill follows, but before we reach the bottom, we pull off into an excellent camp spot 28 km before Safaga (107km; 628m). Finishing off the downhill from yesterday, it is an exhilarating ride to the coast. With wind pushing us most of the way there's plenty of chance to pull out the camera and shoot the pink and salmon rock formations against the brilliant blue sky. Though there is the nagging thought of having to face the headwind when we hit Safaga. It is worse than we imagined. We manage a short, scary distance on the highway at 6 kilometres per hour and then the decision to flag down a pickup is about the only choice we have, if we want to reach Hurghada before dark. An old man stops for us and takes us as far as the checkpoint. He kisses the 20 pounds we give him for the 30 kilometres. He looked like he needed it. Another pickup stops after the military checkpoint and takes us to the outskirts of Hurghada (47km - bike; 50km - pickup; 86m). It is still a difficult ride against the storm as we make our way into a very touristy town minus the tourists. The first hotel wants 120 LE without breakfast, but it is a little dark and gloomy. We settle for Hotel Golden Sun with its bright and airy room, but where they conveniently forget to tell us that the hot water is turned off. If you want it to have a shower or wash your clothes, then you have to ring reception first. We figure we'll only be there for a couple of nights, so what the heck. With a revolution about to happen though, we shouldn't have counted on it. We stay for six nights in total. By that time, I have sussed out where all the honest shop keepers and good falafel bars are: two essentials in Egypt; I remain bewildered at how much of the signage is in Russian; I have seen quite a few young male prostitution deals with middle-aged women and have witnessed the evening that Mubarak steps down. Now, that was a great moment in history and even in the sleepy town of Hurghada, people went crazy. Power to the People: we felt quite privileged to have witnessed the Egyptian Revolution. We arrive at the bus station around 10am and just a bit after discovering my VDO computer had been ripped off my bike. It is too late to turn around and besides there is not much we could do about it anyway. Plenty of big buses in excellent condition pull in, so we think the attendants are joking when they point us to the rickety lump of rusting metal that chugs in. It resembles something out of a Mad Max movie and by the looks of it, a pack of bears had started munching on the chairs one day in a fit of hunger. Besides being filthy dirty, everything that is attached in someway is broken or hanging off. It is on the other hand only 45 LE per person, though the conductor tries to extort double that, saying that our bikes have to pay the same price as a person. We get this extra fee chopped in half after quite a bit of hassle. The Egyptian flags blowing in the vista are pointing due south with a vengeance for the whole 5 hour journey. We pass Zafarana Wind Park with its 300 plus turbines; very befitting of this stormy place and I feel no remorse whatsoever for taking a bus along this stretch. It would have been hell on a bike. Instead it is a rattler journey with local Egyptians also making this 395 kilometre trip along the Red Sea Coast. And just so you know, it is actually a stunning turquoise green and full of not so delightful oil platforms. A phenomenal number of resorts line the highway into Suez, but most are all but empty shells of ideas and pleasure parks long forgotten judging by the peeling paint. The bus station is in the middle of quite sad surroundings too. High rise apartments brimming with sky dishes and washing hanging above muddy rubbish grounds. A young guy on a motorbike offers Ali some speed as we cycle out towards the bridge crossing us over to Port Tawfik (17km; 29m). Here, we are met with an entirely different scene. Families and couples wave as they picnic by the water or watch their children play on the boulevard and we find out quickly that there is just one hotel in the area lower than 500 Egyptian Pounds per night. Hotel Arafat is a total dump and a total rip off for 100 LE per night. I'm sure I picked up some sort of skin flea from this room. The doorman come whatever-job-is-necessary person is totally painful with his incessant winging for "baksheesh". While I am in the room he attempts to shut the door, saying "Madam happy? Madam happy?" I'm not quite sure which method of baksheesh he was preferring, but I didn't give him a chance to get any and scuttled him out quick smart. The wind changes during the night and we wake to gale forces the next morning in the opposite direction. We fly through streets of Suez with tanks every 50-100 metres; rubbish piled high and blowing north like us towards the Suez tunnel. It is a depressing town, drab and grey and filthy dirty. The military presence also makes it a little spooky. I nip down a side alley to buy some bread and vegetables, before we are literally blown out of town. The military at the checkpoint near the toll gate are a friendly enough bunch. They insist we take a truck through the tunnel and a young officer, with the most gorgeous dimples and blue green eyes organises this for us. He should have been a model. He would have made more than he makes now, that is for sure. We heard from a local that the military boys get 80 pounds per month for their service. That is less than 10 euros. There is a queue before the tunnel and we can't go until the go-ahead is given. Watching everyone cope with the wind is entertaining enough and after half an hour flies by as fast as the discarded rubbish, we are in the back of an old man's pick-up and venturing underneath the Suez Canal. 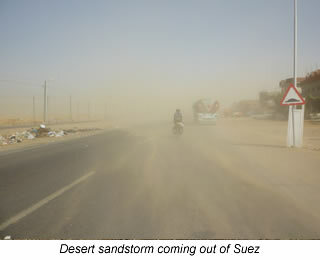 He takes us to the Nuweiba turn-off, where we begin our battle in the desert sandstorm: now hitting us front on. Besides the noticeable amount of sand that forces its way into every nook, cranny, opening and closure of our bikes and bodies, there is a strong military presence here. They pop out of nowhere asking to see our passports before allowing us to move on. Twenty kilometres before Ras Al Sudr, the resorts start, which rules out wild camping in this area. It is one long line of empty cement blocks barricaded off with gates resembling fish, crabs or other ocean forms. The wind drops a little and moves more to our side, bring the pedalling speed up from 6 to about 12 kilometres per hour. Ras Al Sudr (75km; 208m) is quite quaint and unpretentious. We are directed to Hotel Ceceil, where it is normally 200 LE per night. Ali works hard at getting it down to 150 LE including breakfast and we end up staying for two nights because it is just so luxurious and fun to be in a nice place for a change. Everything works: the fridge, the hot water; the television and with cable connection we can catch up on the recent news. Bahrain, Libya and Yemen are in turmoil now, so it doesn't look so bright for our Middle East tour. The wind that howled past our hotel room yesterday is at a minimum this morning and luckily for us, it has turned around. Following the turquoise ocean is a pleasant ride. Just before Abu Zenimah, the rock formations rise high above us as we snake our way in and out of town. The wind etched landscape continues in colours of rose, brown and gold. We renege on the water and bread that one man tries to sell for triple the price and instead fill up at a check point after 95 kilometres. Besides an ambulance station at the 43 kilometre mark today, this is the only official point on the whole journey. Abu Redeis is just 11 kilometres further up and here we notice that the wall of my Egyptian tyre has ripped. So much for that tyre: it didn't even last a week of riding. I suppose the only consolation is that it cost only €2.50. We pull off the main road and head to the police station where the boys in blue are about as useful as an inflatable dartboard. "Where is a bike shop?" we ask after showing them the burst tyre. "No, No" is the answer. "What? There is no bike shop here?" "No, No" comes the answer again and again until I have had enough and tell Ali that we had better go ourselves into the village and look around. We know that there must be somewhere to buy a tyre, because a kilometre back a young boy told us so. And when it comes to knowing where the bike shops are, you can't do any better than asking the young kids. They are a way more reliable source of this information. As we turn left, we spy a couple of them on bikes. "That's who we have to ask", I say. And sure enough, without any language skills what so ever, they lead us with absolute excitement to the local shop that sells tyres. By the time we arrive, we have every kid on a bike within a kilometre radius with us. The tyres are 13 Egyptian pounds each. We get two, just in case and give a two pound tip each to the two boys who helped us. 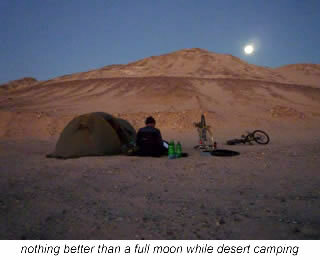 They are ecstatic and we are pedalling off, a little more confident, towards our camp spot up in the sand dunes on a peaceful full-moon evening, 5km before the Sharm el-Sheikh turn-off (138km; 488m). At just 92 metres above sea level this morning we begin our average daily climb of 1%. It is an easy ride through some stunning barren rock formations. The sky is brilliant blue. To be honest, we haven't seen it any other way for quite a number of days. We hit the oasis, Wadi Feiran, officially after 52 kilometres, though there is also a reasonably sized village at the 44 kilometre mark. We fill up on water and head further up the mountain to camp at our highest point in a very long time at 36km before Saint Catherine (73km; 900m). The following morning a couple of Bedouin girls come past with their goats and sheep. All decked out in beaded dresses, head scarves and carrying bottles of water in ornate bags, they stop and stare at us for about 5 minutes before moving on. We move on too and with only 36 kilometres of cycling to do, figure it shouldn't take too long. The wind isn't in our favour and the short distance is pretty tough. The incline is the same, slow and gradual rise until we reach the outskirts of Saint Catherine (36km; 577m). The scenery again remarkable. Sheik Mousa's Bedouin Camp is not hard to find and we are warmly welcomed by Salah, one of the owners. In true Bedouin style, a cup of tea needs to be drunk before we can see or talk about the room. There is a good vibe here. And it is just as well. After four days and on the morning of the 23rd, Ali goes out to buy some bread and instead of coming back with our breakfast staple, he comes back with a fractured ankle. He ends up in a cast and we end up spending way more time here than our intended week. But waking up to brilliant blue skies, fresh, crisp, clean air and gorgeous salmon pink rock formations is quite a treat. You just never seem to get bored looking at the surrounding vista. Sometimes referred to as the Holy Mountains, this collection of peaks is religiously significant and therefore attracts many tourists each year. Though some dispute the exact location, it is believed that Mount Mousa - among several names - is where Moses spoke to God and received the ten commandments. At present Saint Catherine is fairly quiet due to the recent turmoil in Egypt and we have the place to ourselves, which for us is special enough and a welcome change from the chaos of the Nile Valley. It is also the perfect place to make some long term plans.